“Eternity is two people and a ham," wrote Irma S. Rombauer in the original Joy of Cooking. Perhaps you can relate to this statement. I certainly know I can. It's the week after Easter and in my house that means we are diligently trying to use up the leftover Honey Baked Ham. Every year I order more than we need. Perhaps I forget how hard it was to use up all the ham the year before or perhaps, because I only order Honey Baked Ham once a year, I get excited and order much more than could ever be consumed by two people in a reasonable amount of time. Whatever the reason, here I am, left with my piles of ham. The ham bone was frozen for use in split pea or navy bean soup somewhere down the road, a half pound of ham was neatly diced and stowed in the freezer to have at the ready as a flavor base or to add to soups, and a ham and cheese quiche is on the menu for this weekend; still, I was in need of some new inspiration. 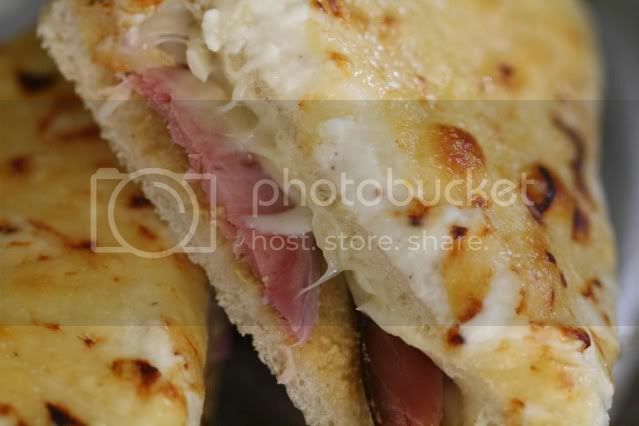 It came in the form of slices of ham and cheese sandwiched between two pieces of sourdough and smothered in a cheesy béchamel. In other words it came in the form of a croque monsieur. This happens to be my boyfriend's favorite sandwich and I am baffled at how it managed to escape me as a way to use up leftover ham. The thick-cut Honey Baked Ham works perfectly in this sandwich. Gruyere is a traditional accompaniment, but I found that a blend of gruyere and swiss was particularly delicious. There is something about ham and swiss that just works. This isn't the lightest or healthiest way to follow up Easter dinner, but let's be honest. Who hasn't already had a few too many pieces of Easter candy this week? Can one croque monsieur really do that much damage? Melt the butter in a saucepan over medium heat. Sprinkle the flour over the butter and use a rubber spatula to combine. Cook the butter and flour for about two minutes, stirring constantly with the spatula. Add the milk, a half cup at a time, making sure the milk is fully incorporated before adding more. Let the béchamel simmer until thickened, stirring constantly for about five minutes. Turn off the heat and add the salt, pepper, nutmeg, ½ cup of gruyere and the parmesan cheese. Set aside. Place the bread slices on a baking sheet and toast in the oven for five minutes. Turn the slices over and toast for an additional two minutes. Brush half the bread slices with mustard on one side and place one to one and a half slices of ham on top. 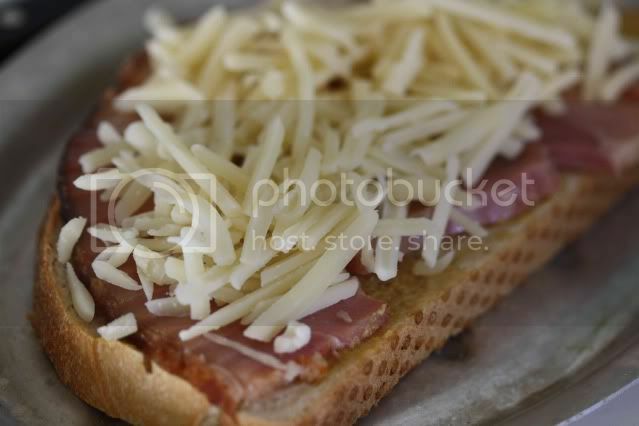 Sprinkle the ham slices with half the remaining gruyere. Spread about a ¼ cup of béchamel over each of the remaining other slices and use them to top the sandwiches (béchamel side down). Spread the remaining béchamel evenly over the top of the four sandwiches and sprinkle with the remaining gruyere. Bake for five minutes. Turn the broiler on and place the sandwiches under the broiler until bubbly and browned, about five minutes. Mmmm, yummy. That photo is making my mouth water! Let me know how the roasted tomato and olive rice turns out! I just cracked up reading your post on fava beans. I just wrote one on fava beans myself, and I had the same thought while I was shelling them...1 hour later - one little pile of beans after all that work? I remember when I worked in a kitchen that did out-catering, we'd have piles of leftover ham after Christmas. God, my wee brain got sore thinking of what to do with it after a while. The croque monsieur is my favorite sandwich. Yours looks delicious! Now that's a grownups ham and cheese sandwich. Looks amazing. I love Honey Baked Ham and what a great way to use leftovers. Also, thanks for visiting my blog and leaving a comment. I appreciate the visit. I've been searching your site and I love the recipes and photos. I'm going to check out that herb salad dressing next. This is a wonderful way to enjoy leftover ham. Using an Ina Garten recipe, you can never be disappointed. Every year, I have the same dilemma. I have lots of ham leftover and am scurrying to find ways to use it. All that is left now, is the ham bone. How have I lived this long without knowing about Croque Monsieur?! It combines so many of my food loves...Thank you for showing me the way. Great looking picture. I'll use the recipe but have to come up with a replacer for the ham. I love the name of the sandwich! 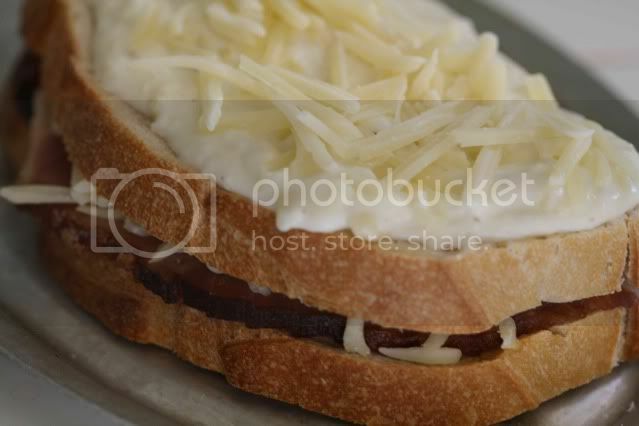 Ah, yes, my blog's namesake sandwich. :) Yours look mouthwatering! and I feel your pain on the leftover Easter meat. We made a brisket this year. We ate it for four days straight, and still have about half of it left! you read my mind..i have been craving these...so tasty! My parents used to make ham on Easter and I remember having sandwiches for days after that, especially since they weren't really creative enough to come up with any inventive leftover redo's. These sandwiches look amazing! I bet a good Cuban sandwich would be awesome also. We, here in Belgium, love our Croque Monsieurs! Yours looks very tasty & so appetzing too! I JUST used up the last of our ham last night in a 15 bean soup and despite the fact that it was fantastic, seeing this picture makes me want to CRY that its gone. YUM. Ham can be daunting. Such a mass of deliciousness. You have some wonderful ideas on how to use it all up and I love the idea of the Croque Monsieur. Good stuff! My half one is always craving this sandwich so I will have to surprise him one of these days with this recipe! Oh my, I am a vegetarian but sometimes meat-y things just catch my eye and this has me drooling! Looks delectable! Ooh... yummy. What great photos! Oh, If i could marry that sandwich I would! Gooey cheese and salty ham, heaven! That picture had me drooling over the screen! I always buy extra ham just to make fab leftovers and for midnight fridge raiding! mmmm mmmm. My mouth is watering. What a delicious looking sandwich. yes, yes, yes. ham and cheese, what a combo. can't wait to try this! Wow, this is one amazing looking sandwich!